Many thanks to Joe, who spent last week living on the farm and doing a lot of weeding!!! 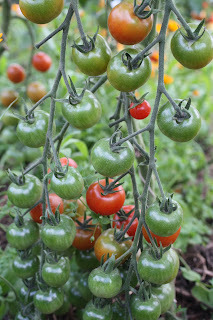 The brassica strip has never looked so tended! 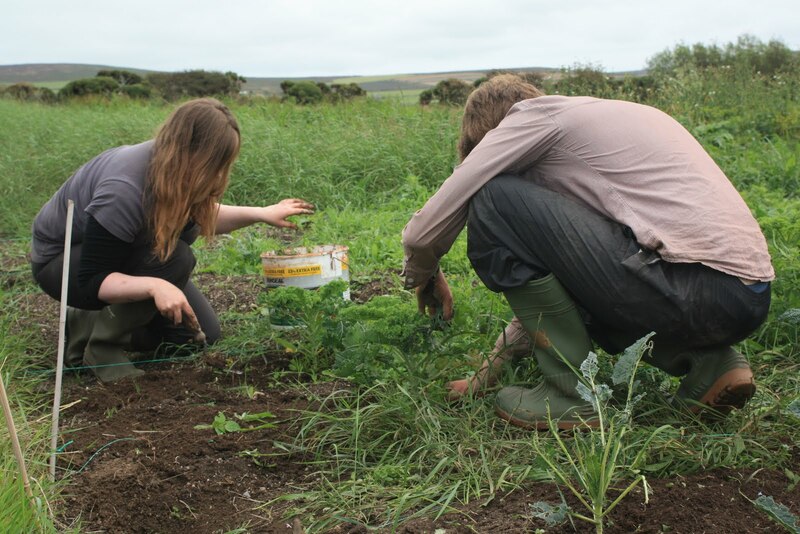 Joe has now gone to volunteer at "Plants for a Future" in eastern Cornwall - see their website at www.pfaf.org - and we wish him all the best. 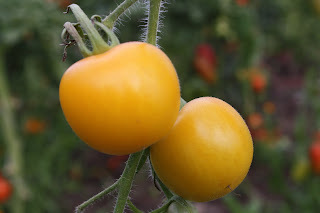 Having received a number of compliments about how good our tomatoes are (available at the farm gate shop, £1.50 for a mixed punnet), I thought it would be interesting to photograph all 8 of the varieties we are growing in the polytunnel this year. 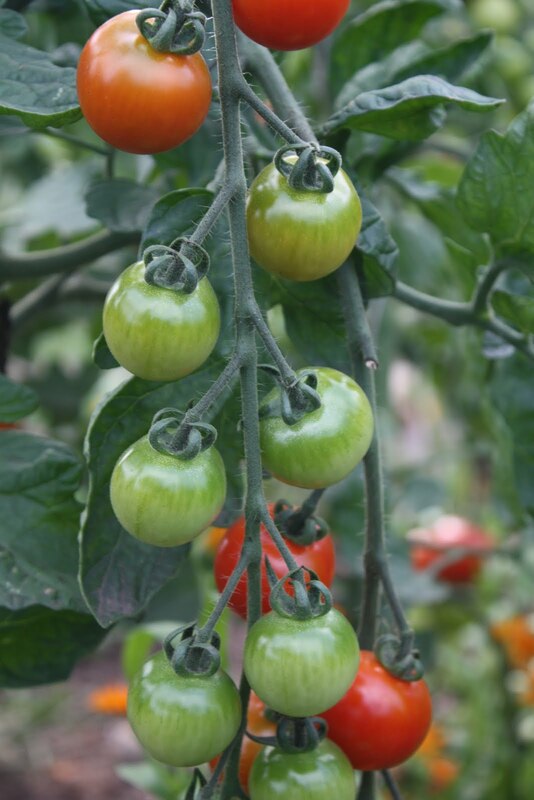 Agro F1 plum tomatoes (hybrid). 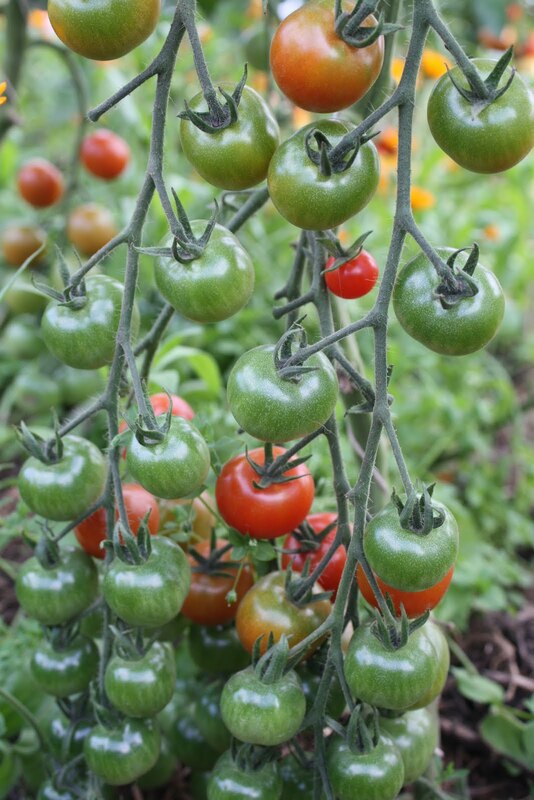 Gardener's Delight cherry tomato, an old classic. Marmande Super, big beef tomato. 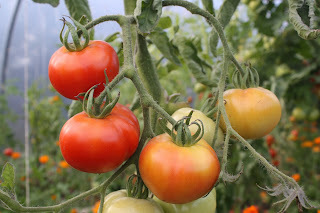 Tigerella, orange and gold striped tomatoes. Yellow Perfection, for a splash of colour. 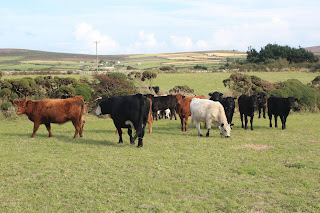 On Thursday August 18th, nineteen Galloway cattle arrived on the farm. They are owned by a local organic beef farmer, and will be fattened up on ten of our fields ready for market. 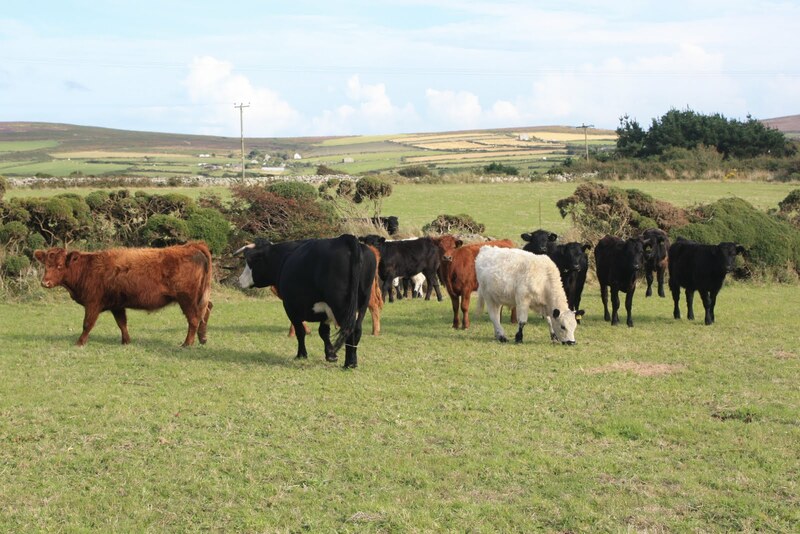 Grazing is an important part of the farm's management plan, keeping the grass down and manuring the land, providing extra income for the farm, putting all the fields to use, and producing an extra crop from the land. Apart from the first morning (when one cow decided to jump over a hedge and go for a wander around the outskirts of St. Just!) 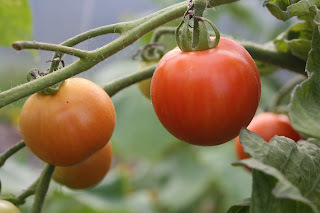 they have been no trouble, and we are glad to have them. After cutting two of our fields for hay, we now have small bales for sale at £3 each. The hay is organic and "rough" (containing a wide variety of grasses and herbs). Please call in to buy a bale or 20, and put the word out too!! 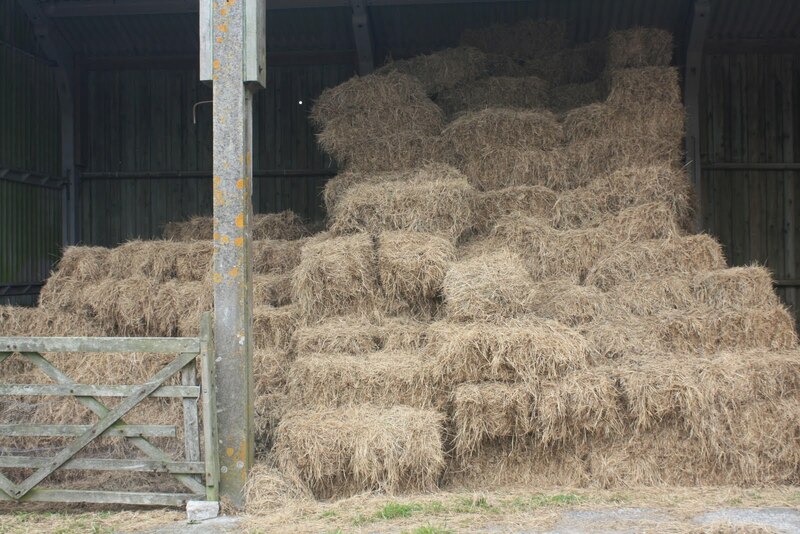 A lovely sight and a lovely smell - our barn full of organic hay. What's available at the farm gate? 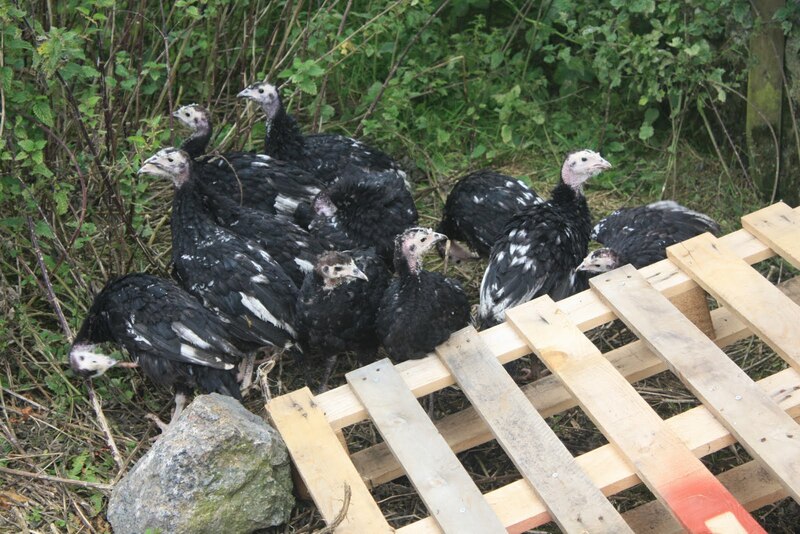 On Friday 5th August our latest venture in livestock arrived on the farm - 21 Norfolk Black turkeys. 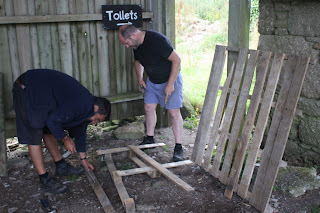 The week before, volunteers had spent a day preparing one of the farm's outbuildings to host our new arrivals, giving it a general clean, constructing perches, replacing a window with a pop-hole (wooden doorway out into the field), and fencing off an area of the field as their run. Jim and Mark making ramps out of pallets. 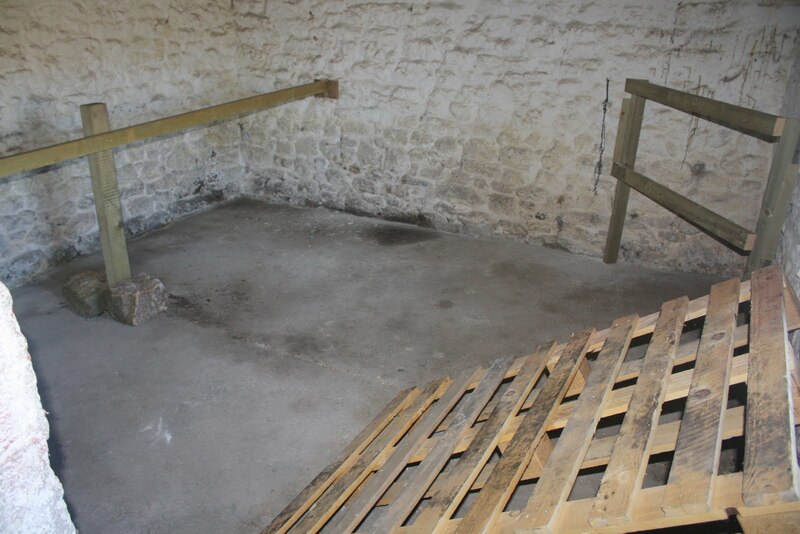 A clean new home awaiting the turkeys. 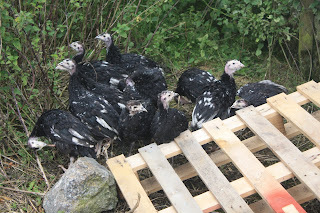 The turkeys will be fattened up on organic grain, then slaughtered and sold as table birds come Christmas - but at the moment they are enjoying exploring their outside run, and are growing visibly every day. 21 turkey chicks on their first foray out of doors. 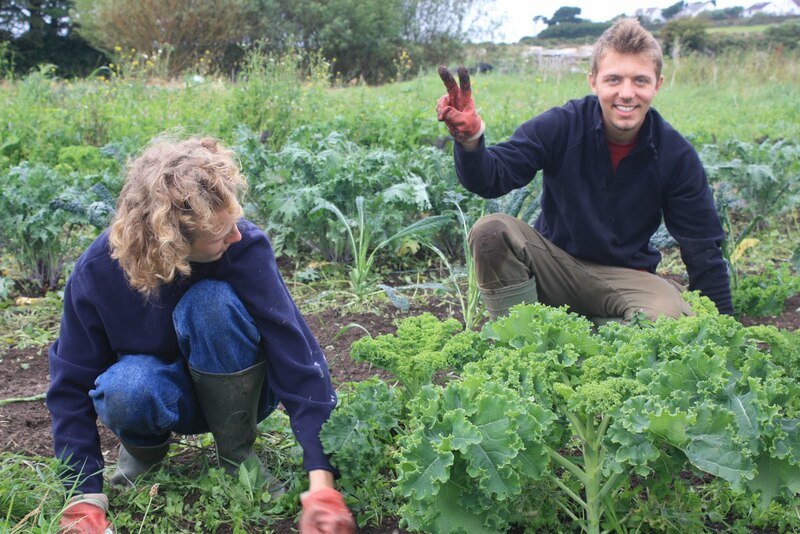 Helen and Toby also weeding curly kale. Wwoofing alongside Giona and Matteo, but staying for two and a half weeks before also departing on Thursday, were Helen and Toby. We appreciate all your hard work, plus your singing at the open mic session in the Star! Giona and Matteo weeding curly kale. 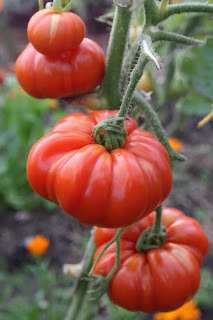 We have just been fortunate to host Giona and Matteo, two wwoofers from Milan, on the farm for 12 days. 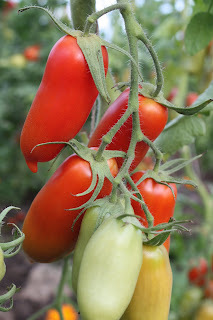 After putting in lots of work on the vegetable field, and cooking several Italian meals for us all, they left on Thursday - thanks for all your efforts, and all the best on your next farm. We still have a few shares in our pigs to sell! A £50 share will give you approximately 8 packs of sausages, 2 packs of bacon, 1 pack of spare ribs, and 1 joint or fillet. Our pigs are Large Black crosses, and will be slaughtered in September or October - your share will be ready for collection soon after. 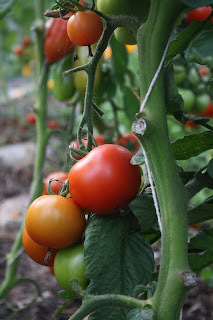 They have been raised on an organic farm and fed organic feed, although they do not come from organic stock. 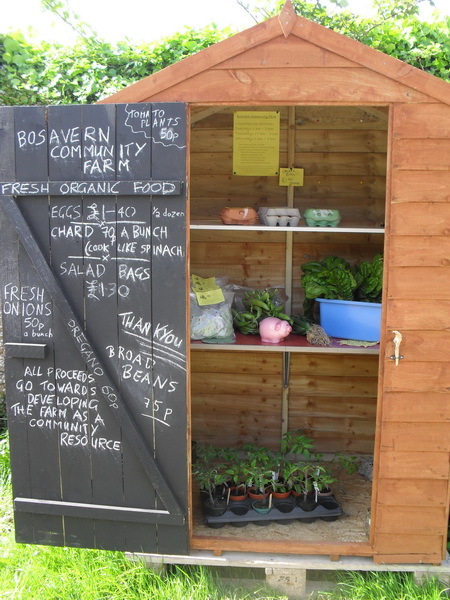 If you are interested in buying a share (and helping your community farm to develop) please phone Hugh on 788454. 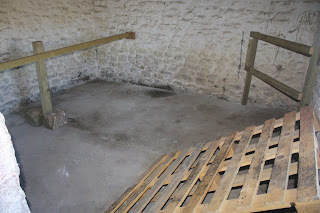 We are delighted to be hosting a series of workshops led by Catherine Lucktaylor here at the farm, after her success at our "Sunflowers and Sundials" event in June. Catherine will be running both a two-day course and a five-day course. The two-day introductory course will be on Saturdays the 10th and 17th of September, from 10am till 3pm each day, at a cost of £95 per person; and the five-day in-depth course will run from Monday 12th to Friday 16th September, from 10am till 3pm each day, at a cost of £280 per person. All materials, firings, and light refreshments will be provided. Please contact Catherine on 01736 874307 for further details or to book your place. "Join me in experiencing the magical transformation of clay into beautiful works of art. A two day introduction to the exciting world of low-fired sculptural ceramics." "For those of you who would like to spend more time experimenting with raku and pit-firings try the five-day course, with more time to research and develop ideas and try out different glazes and firing techniques." Dusk to Dark theatre performance. On Saturday 10th September Bosavern Community Farm is proud to present the Family Album Theatre Company and their performance of "Dusk to Dark". capturing twilight adventures in music and light...."
"Dusk is a magical time of day. It creeps up on us as we prepare for the night. Bringing in the washing becomes a dance of white sheets against the deepening blue. as soon things start to disappear in the grainy half light. as characters on a Cornish campsite go about their business. Velvet curtains swish open to reveal stories unravelled through visuals and song. If you like a good tune this is the show for you." The performance starts at 19:30, and the suggested donation is £4. Parking is in the field, and light refreshments will be available. Please phone Kelsey on 01736 351330, or Deb on 01736 787136, to book a ticket.